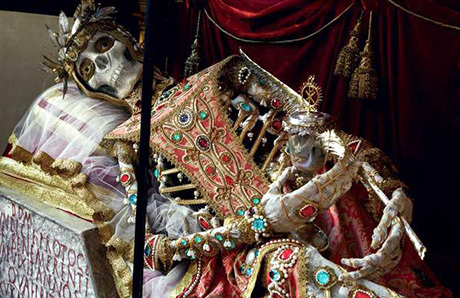 I first became aware of Paul Koudounaris a couple of years back with the release of his Thames and Hudson book, The Empire of Death: A Cultural History of Ossuaries and Charnel Houses, but had forgotten about his beautiful and stunning imagery from religious ossuaries throughout Europe until I received an email from my friend Lee announcing the release of Koudounaris’ new book, Heavenly Bodies: Cult Treasures and Spectacular Saints from the Catacombs (also from T&H). 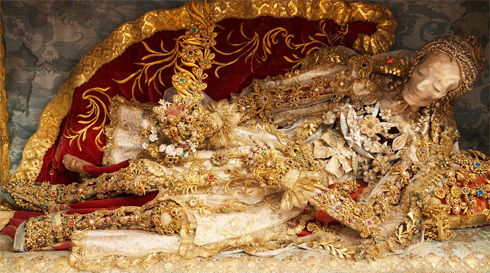 The ultimate veneration, these bejeweled bodies remind us distantly of the illuminated manuscripts from the earlier Middle Ages, but instead of decorating pages of text, we’re looking at the remains of various saints, both male and female, dressed and decorated with such subtle intricacy, all shimmering with silk and gold, sparkling in precious stones including rubies and emeralds. The result is breathtaking. 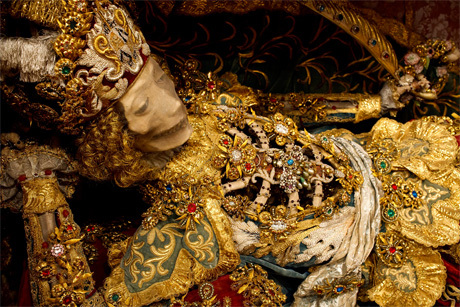 The images are visceral and cannot help but to remind us of our own mortality. 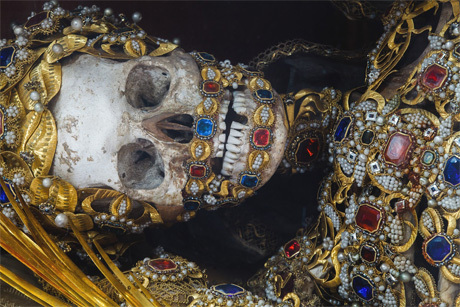 For the meek, the images may be discomforting and perhaps even grotesque, but getting past any unease with looking at the remains of human bodies, what is left are these spectacular and beautiful seventeenth and eighteenth century skeletons photographed with the utmost attention to detail. 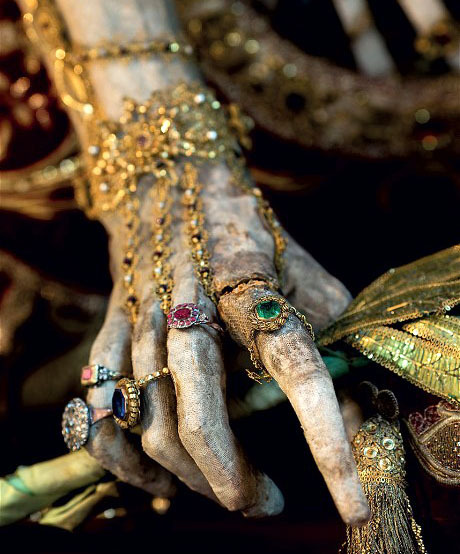 This is an important body of work and visual history, recording a collection of historical artifacts that show a particular reverence for the dead. Almost an odd variation of taxidermy, these figures were reminders to the faithful of the treasures that presumably awaited them in heaven; more of a carrot than a stick a reminder that living a saintly life would perhaps bring the ultimate reward in the afterlife. Koudounaris’ fascination with the ways that death have been preserved, displayed and regarded in various European religious traditions may seem to some macabre, but it is the fear of wanting to know what happens after death that is ultimately the basis for the existence of all religion, so in exploring how some people within certain religious communities honored their saints, we can gain insight into how that attitudes about death have changed in today’s world. La Luz de Jesus Gallery (Los Angeles) is hosting an opening reception and book signing on Friday, November 1, 2013, 8:00 PM. I plan to be in attendance. Added bonus: everyone who buys a book at the opening will get a FREE print from Paul. Tagged with Art, Creativity, death, Jewels, Photography, Skeletons, Skulls.